For decades the mainstay of a hillwalker’s wardrobe has been the humble fleece jacket, so we’ve selected six to see how they perform in the mountains. The Spectrum Micro FZ 2.0 is part of Berghaus’s Made Kind commitment, so it uses 50% recycled content in the fleece. It’s a soft fleece, and it allows a little more airflow than some, as well as good insulation for summer. Combined with other insulating layers it works well in winter too. There is a full-length zip, and you also get two map-sized pockets that are accessible above a rucksack belt. Flatlocked seams help to improve overall comfort. The hem and cuffs are elasticated without additional adjustment. On me both areas had a poor fit, so I’d have benefited from drawcords at the hem and Velcro cuff adjusters to prevent unwanted draughts around the waist and wrists. There is no zip housing at the top either. But at this price it is great for general walking. This mid-weight fleece material allows for good airflow but it also resists the wind a little. It’s nice and stretchy too, so is great for scrambling over rocks. There is a full-length zip to allow ventilation and two zipped pockets that are large enough to take OS maps. The pockets are placed slightly higher on the body than some other designs, so you can access them more easily while wearing a rucksack with a hipbelt. It has a reasonably good general fit too. But unfortunately this Rab fleece lacks some ‘nice to have’ details. There are no drawcords on the hem or cuffs, with only elastication helping the fit in both areas. There is no hood either, and the fleece is not quite warm enough to wear on its own in winter. It works well with an additional fleece layer on the top though, so makes a great year-round option to wear with other layers. This is the non-hooded version of the popular Heron Hood Jacket (£120) that won a Trail Approved award in March 2018. It uses the same 4-way fabric and is made from recycled materials so is good for the planet. The seams are well-placed and have a flatlock design to improve comfort. Although the Heron is not windproof it is noticeably more wind-resistant than some other fleeces. The two zipped hand pockets are accessible when wearing a rucksack. The full-length front zip has a baffle to prevent snagging and housing at the neck to prevent chafing. Something I don’t need but others may miss is a drawcord at the hem. The fabric has a good abrasion-resistant finish on the outside, while inside it is fluffier to add warmth. However, it is quite a lightweight fleece, so is more suited to summer or for layering in colder conditions. The Diablo provides all the basic needs of a hillwalker, so is there any reason to pay more? I’ve been wearing this fleece regularly for a year and it has proved its worth. It is made from a good fleece material that offers warmth for year-round use, although in winter I need an extra fleece layer under it to take off the chill. It is very breathable, so it also works well under a waterproof jacket without allowing condensation to build too easily. The two main pockets both take an OS map and can be accessed above rucksack hipbelts. The addition of a hood means I don’t need to find a hat when the temperature drops for short periods, and of course a hood cannot be dropped or blow away. The zip housing at the top of the main zip prevents scratches on my neck, while flatlocked seams also add a little more comfort. Overall I am happy with this fleece for hillwalking and trekking, and it’s also a good price for what you get compared to others. While I like it and have worn it regularly over the last 12 months, including six weeks walking the Camino de Santiago (pilgrims’ way in Spain), the hem on this fleece is quite loose on me. I need the size L for body length, so I wished there was a drawcord I could cinch in to lock out draughts. The cuffs too are not as tight as I’d like for battling through wild weather. The hood would also be even better if it fitted just a little closer. But these are tiny niggles and will depend on your body shape… I am just quite skinny! There is no third chest pocket either, something I like for a GPS receiver, guidebook or map, so the main pockets can be used just for handwarming. Durability has not been an issue, but the higher-priced materials are undoubtedly more durable. 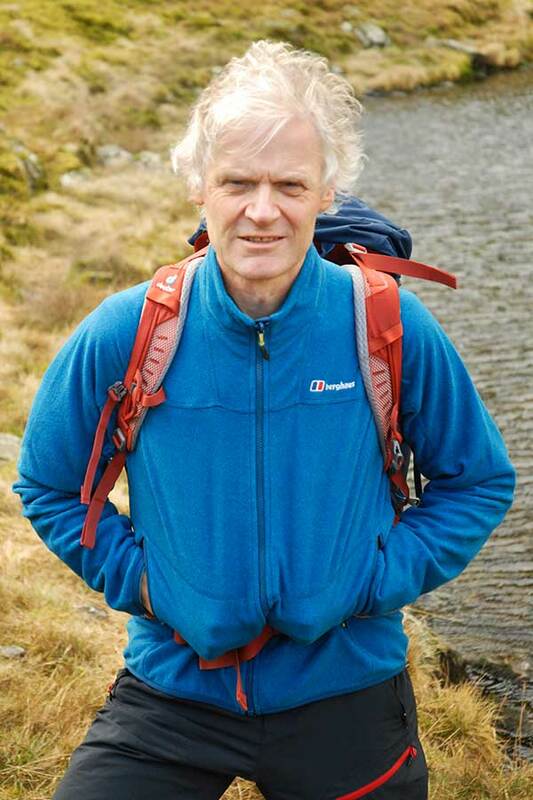 A great all-round fleece for trekking and hillwalking if you want to control your budget limits, and don’t need the extra benefits that come with paying more. The Iridium offers durability and a third chest pocket, but do you really need those features? The Iridium Hoodie is made from Pontetorto Technostretch fleece, and has an external ceramic print to enhance durability, while the lower-priced Hybrid Hoodie (for women) doesn’t use this fabric throughout, instead having a light stretch fleece on the sides. The Iridium is a very comfortable jacket to wear, with a fluffy inner and flatlocked seams. The stretchable hood moved well with my head, even though there is no drawcord to make further adjustments. There is a useful third GPS device-sized chest pocket, and both zipped hand pockets are sited high enough to be easily accessible while wearing a rucksack. The full-length zip has a baffle on the inside to prevent both cold spots and snagging, and there’s also a zip housing at the top to prevent chafing around the neck. In terms of warmth, the Iridium is ideal for general hillwalking, and can be worn with other insulating layers in winter, as I did when I wore two fleeces at once on our chilly photoshoot. Women only get the option of the Hybrid version of this jacket, which doesn’t benefit from the same amount of Pontetorto Technostretch fabric. Also, while the four-way stretch material fitted me well, there’s no option for adjustments as no drawcords are provided at the hem or the hood, and the cuffs only get elastication, so you need to check it fits your body shape. It also costs a little extra and weighs a bit more than other jackets on test. An excellent, well-designed, comfortable, mid-weight stretchable fleece with a useful chest pocket and hood for use when active on cooler days. Does the higher price tag make the Kyanite the perfect option for the hillwalker? The Kyanite is made from Polartec Power Stretch Pro, a well-proven fabric that has a more elastic and body-hugging feel than others. It also feels really tough thanks to its tight durable outer face, as well as all that nylon, which other fleeces just don’t have. This benefit makes it better for mountaineering and harder use than some other fleeces. On the inside it is fluffier, and overall it feels slightly warmer and more windproof than the others here, making it ideal for year-round use; but it is also breathable enough to wear under a waterproof without becoming clammy. I was also able to wear it over the other fleece I was using on this photoshoot and together they were ideal for the cold winter day we experienced. 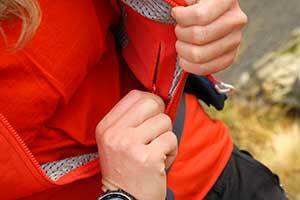 The two good-sized pockets can be easily accessed while wearing a rucksack, and the hood is stretchy and fitted well. The hem and cuffs are elasticated and also fitted me fine. The Kyanite comes in fantastic colours, rather than just the usual pinks and purples for women! With only elastication to manage the fit of the hood, hem and cuffs, it’s worth making sure this jacket fits as it cannot be adjusted to lock out draughts. Also there is no third chest pocket on the outside, only an internal valuables pocket. The price is probably the biggest challenge here, and it is certainly one to make you think when you compare it with others. The most likely cause of the price hike is the use of Polartec Power Stretch Pro, as adding nylon to the polyester will crank up the price, and also the fabric is far more stretchy too. So you need to decide if this fabric is worth the extra cash. Certainly for regular hill use, I love this jacket more than the others – but the price does make me wince! A durable fleece that is very stretchy and body-hugging, making it ideal for regular users, particularly while mountaineering or scrambling, but the price does chill the dream a little.